I don't watch too many cop or legal type shows on TV. At least not at this point of my life. Oh, when I was a kid I was into all those: Starsky & Hutch, Columbo, Baretta, S.W.A.T. I watched them all as a teenager. But the shows nowadays.... Eh. They just aren't my cup of tea. I did watch the first season of True Detective on HBO. Maybe I will watch the 2nd season. But the CSIs, Law and Order, Hill Street Blues and the rest I don't care for. I can't even get into Brooklyn 99. One of my absolute favorite shows was Ellery Queen. Just one season (because of ratings), but I loved that show. It was a TV version of Encyclopedia Brown, which were books I could not check out fast enough from the public library. If you never watched Ellery Queen, it was set in the late 40's. A police detective gets help from his mystery writer son in solving tough murders. About 10 minutes before the show would end, the actor playing Ellery would break the 4th wall, turn to the screen and ask the viewers if they solved the crime. The show would hit a commercial, then come back and reveal the murderer. I ate this show up. I mention this because I was about to present a mystery on this blog and ask you, the reader to help me. Then I received a package a couple weeks back from Weston at Fantastic Catch. I relate these two because 7 of the nine cards in the package are directly related to the mystery I was about to enlist your help in solving. I'll get to those in a bit. Let's jump on some other cards first. Starting off we have two cards for two different binders. 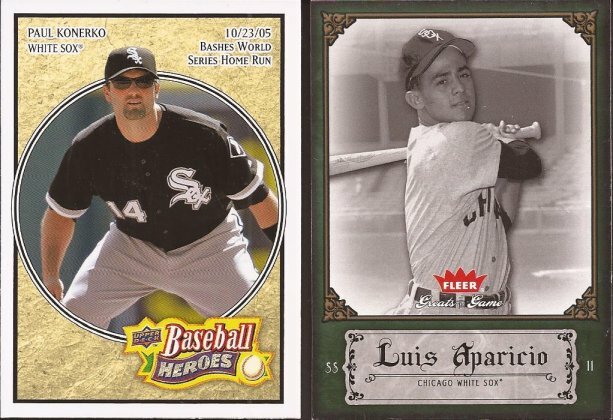 I never realized how many colors there are in the Baseball Heroes release until I added this care to my Zistle Konerko collection. Holy crap, Upper Deck - REALLY? We'll see how many of those I can find. The Aparicio goes into the Luis binder. More color madness, this time from Topps. But when you need them for the Sox Box, you need them. After Zippy Zap, I think Weston would be the next big prospect hunter I know. It's fortunate for me Weston sends me all the Bowman and Pro Debut cards he does since I buy so little. I would say at least 30% of the prospect cards I have are from Weston. Ok - here's comes the mystery for you folks. It started when I was going through some dupes and found this card. That's 7 of the 9 cards I need. 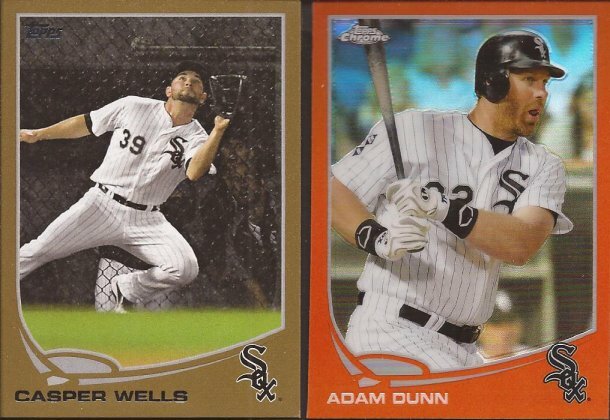 I plan to get the last two, but do these go into the bunting binder? I know a few of you can find the photo of a card via Getty Images, AP or whomever. And I gotta think this caricature is based on an actual photo. I would love to see that image to give me a better basis of where these cards end up. So thanks again, Weston. And detectives - HAVE AT IT! I also read all of the Encyclopedia Brown books too when I was little...and when I got older, the Two Minute Mysteries. I agree, this appears to be a bunt and with the way he is looking it was a pop-up. A full swing would have his arms extended. I was thinking it was a full swing and he was upset and getting ready to drop his bat in disgust. 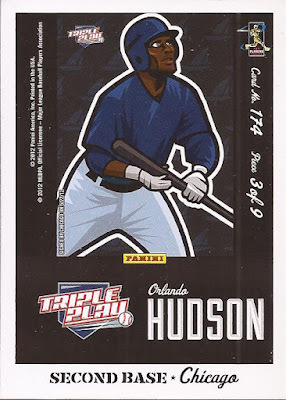 Looks like Hudson just launched a HR and is about to throw his bat and do his trot. As for TV shows... love CSI. Ellery Queen sounds awesome. I'll have to track down some episodes on the net. I actually never noticed that. Glad you enjoyed the cards. I'll set some more aside for you. 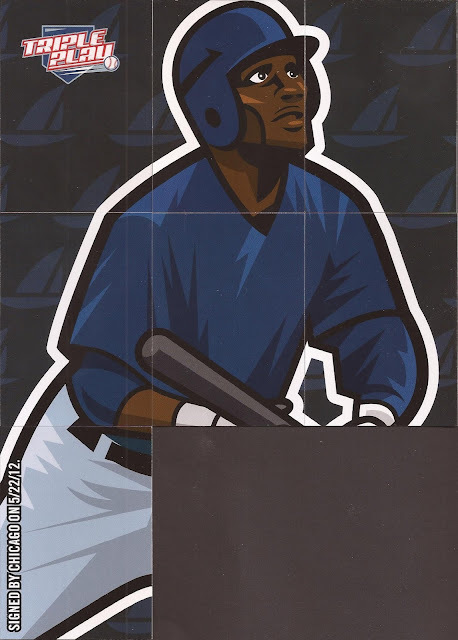 I had #8 of the Hudson puzzle, the bottom middle. I use the past tense, because I just placed it in a PWE for the burbs. Hopefully it's not too hard to track down the corner. You may want to look under the table or between the couch cushions . . . that's what I do when I'm missing a puzzle piece. Don't know about the card mystery but I too loved Ellery Queen at the time. The only episode I recall might have been the first one, about a radio show. I recall Ellery either hailing a taxi or getting out of one, a real checker cab type cab. S.W.A.T. (at the time I think it technically should have been S.W.A.T.T. since the acronym was Special Weapons And Tactics Team) I still have the 45 of the original theme song. Bunt, but as a member of the Padres.